Successful certification of pressure resistance and compliance with European diving device standards EN250 and EN14143 by Germanischer Lloyd (now DNV GL) for the U1000 series. The two certificates shown here are representative of the certified series T1, T2, U1, U2, U200, UX, UX GSG9, EZM13 and EZM 3. So what does DNV GL (formerly Germanischer Lloyd) have to do with a watch manufacturer from Frankfurt am Main? 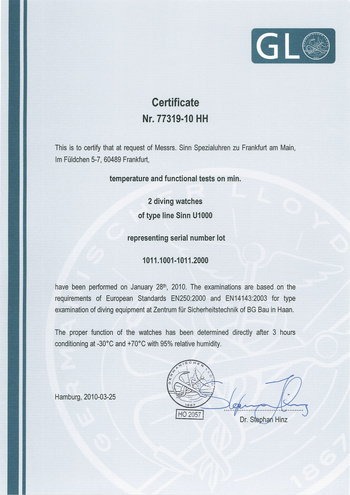 The renowned company tests and certifies our diving watches according to a variety of criteria. One test focuses on water resistance and pressure resistance, while a second test procedure covers something never done before in the watchmaking industry: certification in accordance with the European standards for diving equipment! The background: time plays a crucial role in survival on every dive. Diving watches must therefore be water-resistant, reliable and durable, and guarantee perfect readability in all lighting and water conditions. The information we provide about our diving watches is thus not merely captured in words, but proven in practice as well. Since 2005, DNV GL has been testing our diving watches for water resistance and pressure resistance. In accordance with these certification standards, the EZM 3 and EZM 13 are pressure-resistant to 50 bar, the T1, U1, U212 and the U1000 series are pressure-resistant to 100 bar, while the T2, U2 and U200 series are pressure­resistant to 200 bar and the UX series is actually pressure-resistant to any accessible diving depth. For this series, DNV GL has confirmed the pressure resistance of the case to 12,000 m and of the movement to 5,000 m diving depth. The tests are repeated at regular intervals on all of these watches in order to document the consistency of the quality. In a standardised test situation, will a diving watch deliver the same reliable performance as, say, a breathing apparatus? 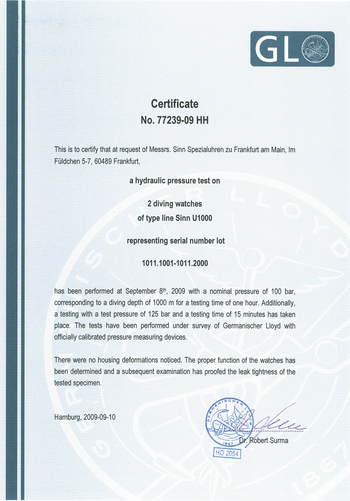 To answer this question, we were the first who have watches tested and officially certified according to the European standards for diving equipment. Also these tests are performed at regular intervals for all these watches. The testing and certification according to the European standards EN250 and EN14143 was completely new territory for both sides. This was the case because the standards for diving equipment cannot be applied to watches without modification. The experts at Germanischer Lloyd thus adapted the standards appropriately and defined two series of tests. In the first of the two, they put the timepieces in a test cabinet for three hours at minus 20°C, then for three more hours at 50°C. The timepieces were subsequently checked for accuracy and functional reliability at both temperatures. In a second test, the watches had to withstand three hours at minus 30°C and 3 hours at 70°C with 95% humidity. Temperature resistance and perfect functioning were documented and certified for the watches in the U1, U1000 (since 2007), U2, U200 (since 2009), T1, T2, U212 (since 2013), EZM 13 (since 2014) and EZM 3 series after both tests. The UX series watches were also certified; however, these were subjected to a modified test involving temperatures between minus 20°C and 60°C due to their battery operation and oil filling. DNV GL provides technical testing and certification as well as software and independent advisory services to the energy, oil and gas, and maritime industries. DNV GL is represented at 300 locations in more than 100 countries. Every day, over 16,000 employees around the world help customers to make the world safer, smarter and greener. DNV GL was the result of a merger between the classification companies Det Norske Veritas (DNV) and Germanischer Lloyd (GL), both of which started out in shipping almost 150 years ago. In the early days of maritime trade, whoever entrusted a ship to transport their goods or even sailed on board themselves as a crew member or passenger wanted to know that the ship would be safe on its travels. Shipowners and merchants would not rely solely on the good reputation of the shipbuilder or captain. Objective criteria had to be created in order to check safety standards. Even back then, the technical quality of a ship was decisive in ensuring the safe transportation of cargo and passengers on the high seas. On the initiative of various shipowners, an advisory committee was formed to deal with ship classification. While 1864 saw the foundation of the classification company DNV, three years later the articles of incorporation were signed in the great hall of the Hamburg stock exchange to establish GL. Almost 150 years later, in September 2013, the merged company DNV GL commenced operations. The DNV GL merger created not only the world’s biggest ship classification company, but also one of the leading providers of testing and inspection services for the oil and gas industry as well as an expert in renewable energies and smart grids. DNV GL is also one of the world’s top-three certification bodies for management systems.